14ga in 1/4", 5/16" or 3/8"
Over 60 designs and colors in clickers and rings! 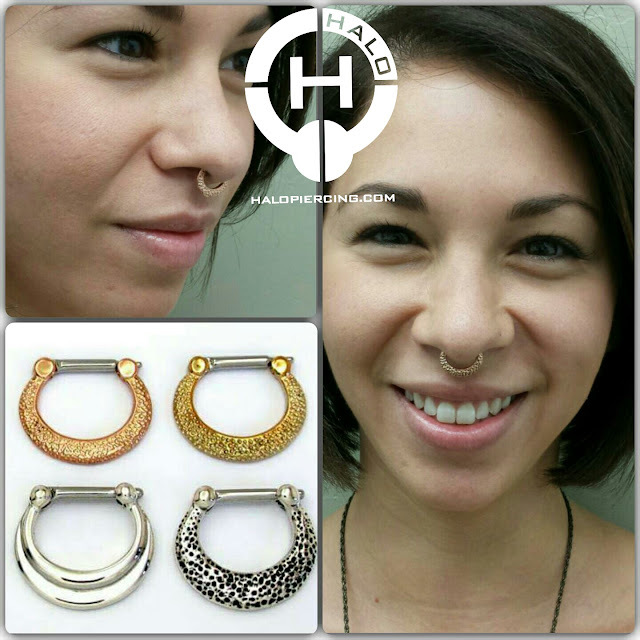 We also have retainers from 16ga to 2ga to hide your piercing. Although November's Birthstone comes in a variety of colors, Orange Topaz, also known as Precious Topaz, is the traditional November Birthstone. It is the symbol of friendship and the state gemstone of Utah. Topaz soothes, heals, stimulates, recharges, remotivates and aligns the meridians of the body - directing energy to where it is needed most. Topaz promotes truth and forgiveness, brings joy, generosity, abundance and good health. It promotes openness and honesty, self-realization and self-control. It aids in problem-solving, assists in expressing ideas and stabilizes the emotions. It is thought to aid in digestion, combat eating disorders, fortifies the nerves and stimulates the metabolism. Topaz typically crystallizes in granitic pegmatites or in vapor cavities in rhyolite lava flows like those at Topaz Mountain in western Utah. It can be found in various areas including the Ural and Ilmen mountains of Russia, in Afghanistan, Sri Lanka, Czech Republic, Germany, Norwa, Pakistan, Italy, Sweden, Japan, Brazil, Mexico, Australia, Nigeria and the US. October Birthstone - Opal & Tourmaline! Opals and Tourmaline represent hope, creativity and innocence. They also protect the wearer from envious, mal-intentioned people. Opal is a gem-quality form of hydrated amorphous silicon dioxide. Its name is derived from the Sanskrit word for 'stone'. It is gemologically classed as a mineraloid rather than a mineral, owing to its amorphous form. Opal is considered to be the national gemstone for Australia, owing to the fact that Australia produces roughly 97% of the world's entire supply of Opal Gemstones. Opals can be divided into three main subgroups: Precious Opal, Fire Opal and Common Opal (potch). For ages people have believed in the healing power of Opal. It is reported to be able to solve depression and to help its wearer find true and real love. Opal is also said to stimulate originality and creativity. Opal is porous and because of this, it is quite absorbent. Due to its ability to absorb, it is thought that it can pick up the thoughts and feelings of people and amplify emotions. Synthetic Opals can be made into almost any style jewelry you need. Tourmaline is not a single mineral, but a group of several closely related minerals. The three most well-known members are Elbaite, Schorl, and Dravite. Tourmaline can be bi-color or tri-color; watermelon (seen below) features green, pink and white colors. Tourmaline is found in many locations including Brazil, Afghanistan, East Africa and the United States. It is estimated that tourmaline has been used as a gem material for over 2000 years. The Chinese carve Tourmaline into beads, badges, buttons, girdles & various ornaments. The Dutch noticed that the stone attracts ashes and straw when heated and named it aschenstrekkers (ash drawers). Colors include black, brown, green, red, pink, blue, and gray. White, colorless, yellow, orange, and purple colors. Crystals are frequently multicolored, containing two or more distinct colors.